“The reason we chose this venue to kick off the project is because the storybook emphasizes parent-child relationship building in the home and diversity in the community,” said Trace Skeen, CVM Rotary president and author of the book. “It is also a great opportunity for us to give back to a population that makes valuable contributions to our workforce,” said Spanish-speaking Gifford Baugh, a past president of the Club. The story of Cache Valley’s new comers was hand-illustrated in the format of a coloring book by Little Bloomsbury Foundation Youth Art Ambassador Shelby Jones. The storybook is designed to help different ethnic groups recognize their family’s historic role as “pioneers.” It follows the friendship of three young people with Latino, Asian, and European backgrounds. The book has bilingual narrative in both English and Spanish and is aimed at promoting diversity and inter-generational relations-building. "I can't wait to read the storybook and color it with all my three children, their cousins and abuelos (Spanish for grandparents), “ said Elba Jaco. 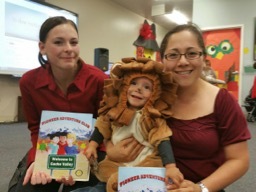 Since 2007, Cache Valley Morning (CVM) Rotary Club has given out over 10,000 copies of “Andy & Elmer's Apple Dumpling Adventure,” a Coloring & Activity Book to second-graders in up to 22 schools in the Valley to support the instruction of ethics and character development. In addition to literacy programs and youth leadership training, CVM Rotary also supports other local non-profits including The Family Place, Centro de la Familia, Cache Valley Food Pantry. The Club also provides annual support to a children’s home in Phnom Penh, Cambodia. The Club meets Tuesday mornings at 7:30am at the Cache Valley Hospital, classroom 8. Photo caption 3: Rotarian Dennis Briscoe, General Manager of Microbiology Business Unit of ElitechGroup, Inc. enthuses parents with the 4-Way test of the Rotary Club, in Spanish.